ALEXANDRIA, VA (October 1, 2010) – The Recreational Boating & Fishing Foundation (RBFF) today launched a new promotion aimed at recruiting Ambassadors for its Anglers’ Legacy™ program, a national mission from the Take Me Fishing™ campaign that asks outdoor enthusiasts to preserve the legacies of boating and fishing by introducing at least one newcomer to the sport. ‘The Bassador,’ a talking fish that is featured in a series of fun and lighthearted viral videos, uses an irreverent approach to encourage current Ambassadors to recruit new members. For each friend they get to take the Anglers’ Legacy Pledge, Ambassadors earn a chance to win a trip the Bassmaster Classic in New Orleans, La. on February 18 – 20, 2011. 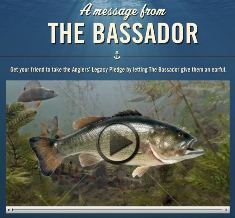 The Bassador videos are hosted on AnglersLegacy.org and have been distributed to the program’s more than 230,000 Ambassadors. Currently, two videos are available (Minivan and Rod). In the coming weeks, two more videos will be revealed. Current Ambassadors are being encouraged to send the videos to their friends. For each friend they get to “Take the Pledge,” they receive one entry into the Catch the Big One Sweepstakes, which runs through November 21, 2010. The grand prize is a trip to the 2011 Bassmaster Classic that includes round-trip airfare for two from anywhere in the U.S. and a three-day, two-night hotel stay. The new Ambassadors who are recruited through the promotion are eligible to win a new Shimano Volteaus rod and reel combo. For Official Rules and eligibility information, visit AnglersLegacy.org. The Anglers’ Legacy program has recruited more than 230,000 Ambassadors nationwide since its inception in May 2006. Based on a recent RBFF survey, when Ambassadors introduce newcomers to the sport, they purchase an additional $168 in fishing tackle and equipment and $166 in boating supplies and accessories annually. They also purchase more fishing licenses which support critical fish and wildlife management efforts through the Sport Fish Restoration Program.